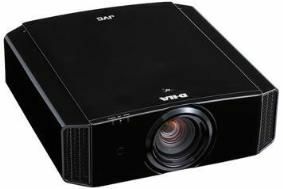 UPDATE: JVC reveals more details on 3D projector range | What Hi-Fi? After first breaking cover at the Manchester Home Entertainment Show, JVC has confirmed details on the three new 3D projectors. Claiming "native contrast ratios that are unmatched in the industry", the three models are due in November and will come boxed with a set of glasses and a 3D signal emitter. This emitter has tended to be found inside the TVs we've seen, though some companies, such as Sony, have also offered TVs with external emitters. All three models have the new generation D-ILA optical engine, with internal tweaks aimed to improve black levels, brightness and motion. The DLA-X3, DLA-X7 and flagship DLA-X9 will come with one pair of JVC's PK-AG1 3D glasses, which will otherwise retail separately for £160. A PK-EM1 3D signal emitter will also come as standard and syncs the projected image with the glasses. It's also available on its own for £70. The prices, as below, are confirmed at £3600, £6600 and £9600. Read more about the new 3D projectors from JVC, and others, in the December issue of the magazine. Exciting news from JVC: it will be bringing its new range of 3D-ready D-ILA projectors to the Manchester Home Entertainment Show running from October 16th-17th. There are three models: the DLA-X3, DLA-X7 and flagship DLA-X9. They'll cost £3600, £6600 and £9600 respectively, including 3D emitter and 3D glasses. All three models have a claimed contrast ratio of 100,000:1 and a new-generation D-ILA optical engine, which JVC claims offers "dramatically improved" black level performance. Brightness has also been increased to 1,300 ANSI Lumens, and JVC's double-speed Clear Motion Drive has been further improved to reduce motion blur. The DLA-X7 and DLA-X9 have been designed to meet THX certification standards, and are currently being tested by THX. They've also been designed for ISF certification and will include an ISF C3 mode for professional calibration. A glossy black cabinet is standard on all models, with white available as an option on the DLA-X3. In the UK, JVC's PK-AG1 active-shutter 3D glasses and PK-EM1 3D signal emitter will both be included as standard.